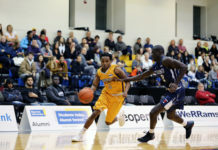 Myles Charvis drives to the basket at the Meridian Centre. Photo by Trung Ho. 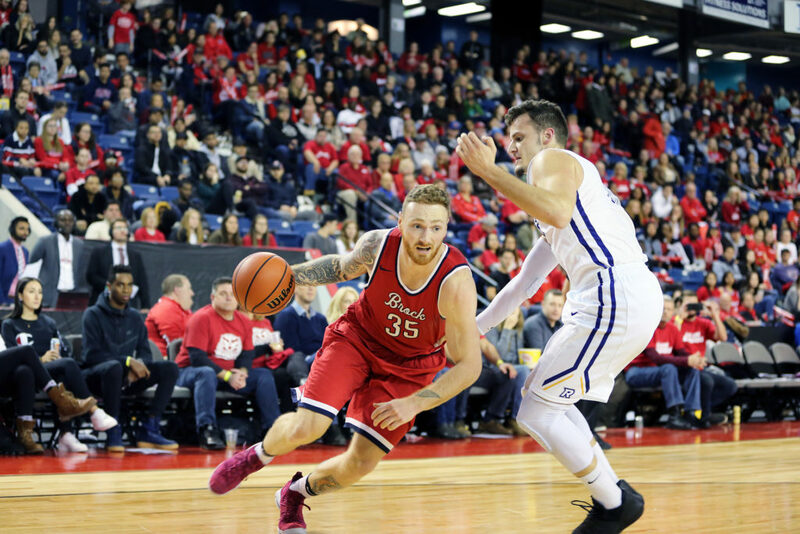 On Saturday night the Brock Badgers held their annual special regular season basketball game in downtown St. Catharines at the Meridian Centre, where the attendance was announced to be 3,175. Both the Ryerson Rams men’s and women’s teams hoped to stay undefeated as the Badgers’ men’s and women’s teams headed into the game each on a three-game winning streak. 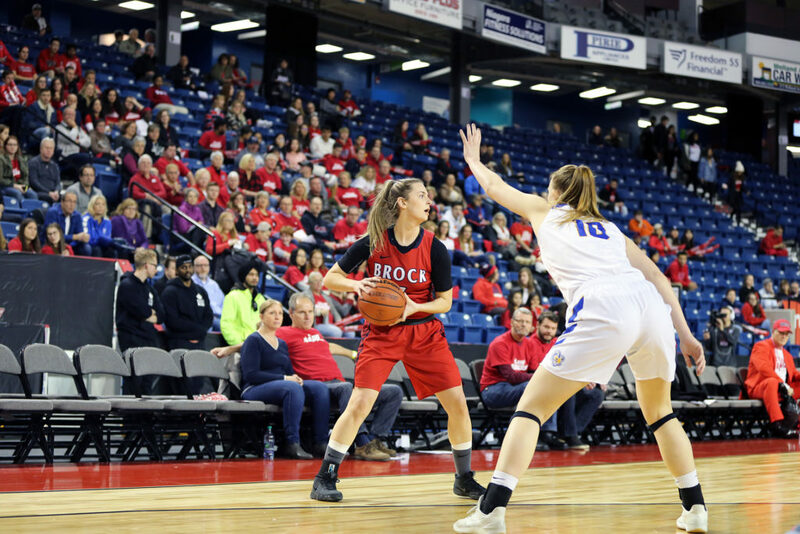 Marin Scotten had 17 points and five rebounds, while Rachel Farwell scored 12 points off of the bench as the Ryerson Rams remained undefeated through their seventh game of the season, beating the Brock Badgers 81-55. Sofia Paska also added seven points and 10 rebounds in her second game back for the Rams. The OUA’s second leading scorer, Melissa Tatti, led the Badgers with 22 points, five assists and seven steals, and Sofia Croce added 10 points off of the bench. After the Rams opened the game on a 7-1 run, the Badgers made a run of their own to keep the game within reach through the first 12 minutes of play. A 3-pointer by Baelie Campbell gave the Badgers their first lead of the game at 15-14 late in the first quarter, for what would become the home team’s only advantage on the night. The Rams started the second quarter outscoring the Badgers 14-2, holding their opponents to just one made field goal in six minutes. The size advantage and post-play of Paska and Bronwyn Williams helped create shots for the Rams’ offence, as they converted on four 3-pointers to close the half with a 40-25 lead, including one each from Hayley Robertson and Jama Bin-Edward, and two from Scotten. The Rams took their largest lead of the game at 65-35 with 17 seconds left in the third quarter, after Scotten knocked down her third 3-pointer of the game. Rams coach Carly Clarke started the fourth quarter with four reserves alongside fifth-year guard Cara Tiemens, who finished the game with three points and three assists in 35 minutes of action. Coming into tonight’s matchup, Williams was the Rams’ leading scorer, averaging 12.5 points per game as the 20th leading scorer in the OUA. 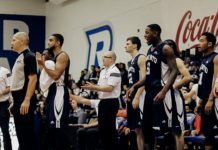 The lack of individual scoring is a demonstration of the Rams’ balanced offence, which has been a key to the program’s strong start to the season. Maddy Gojmerac looks for a pass with Bronwyn Williams on defence. Photo by Trung Ho. Despite a lopsided end result, the game at the Meridian Centre continues to be a special experience for both sides. For Clarke, although it was a point of emphasis to make sure that the experience was one that the athletes on the Rams would soak up as well, she recognized that organizing special games like this are important to building the league. Cassidy Ryan drives to the basket. Photo by Trung Ho. 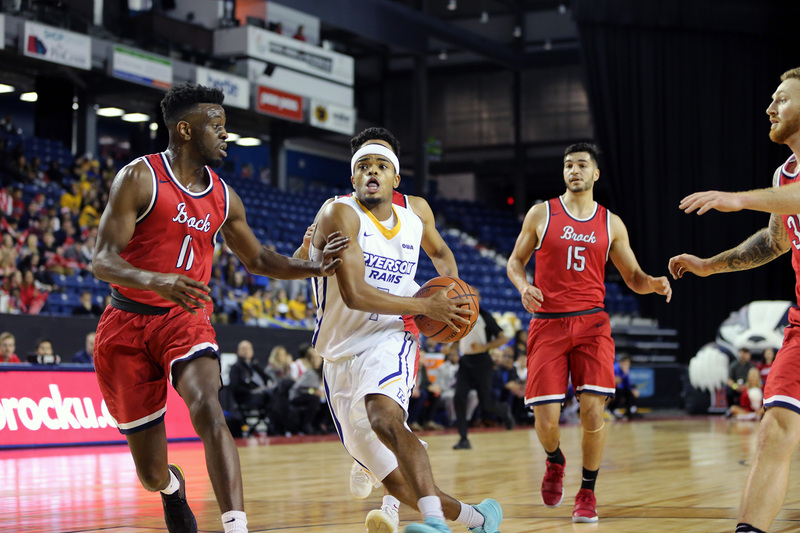 In a mid-season OUA East versus West showdown, the undefeated Ryerson Rams were put to their first test of the season as they closed off a four-game road trip in St. Catharines against the Brock Badgers on Saturday night. J.V. 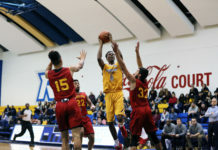 Mukama had 21 points for Ryerson while Myles Charvis added 19 points and seven rebounds, as the Rams rallied in the second half from an 18-point deficit to improve to a 7-0 record this season. Johneil Simpson recorded 19 points and seven rebounds for the Badgers, while Kascius Small-Martin, Tyler Brown and Cassidy Ryan all added 10 points apiece as part of the starting unit. Coming into the game as league leaders in assists and 3-point percentage, Brock opened the game with long-range baskets on back-to-back possessions by Small-Martin and Simpson, who would later on combine for 18 of the Badger’s 27 first-quarter points. The energy of the more than 3,000-plus fans at the Meridian Centre would give the Badgers the momentum they needed to close the quarter with a 16-point lead, including a 3-pointer at the buzzer by Brown that capped off an efficient 61.1 percent first-quarter shooting against the OUA’s leading defensive team. Brock headed into the second-half with a convincing 38-22 lead, en route for what would seem like handing Ryerson their first loss of the season. The Rams opened the third quarter on a mini 9-4 run, but an unfavourable blocking foul called against Mukama seemed to have been a turning point. Mukama reeled off six straight points with back-to-back 3-pointers of his own, cutting the lead to single digits with 3:50 left in the quarter. The Rams had an urgency come out of the half with much more aggressiveness, and three straight fast-break lay-ups narrowed Brock’s lead to 52-45 heading into the final frame. The Rams continued their second half attack, while Simpson went cold, making only one of eight field goal attempts in the fourth-quarter. A jump shot by Ryan gave the Badgers a 62-56 lead with 5:16 left in the game, for what would become Brock’s last basket of the evening as the Rams moved ahead on a 15-0 run to complete a thrilling come-from-behind victory. Article and photos by Trung Ho.